Music notation is a universal language understood by musicians across the world. It contains all the information you need to play a piece of music such as what notes to play, when to play them and for how long. It will tell you what tempo to play the piece (i.e. how fast), how loudly or softly various notes should be played, how the music should be interpreted, and what rhythm should be used. That’s a lot of detail in a small space. For a guitarist, all that information is contained on one staff. It can look quite daunting at first but if we break it down into bite-sized chunks music notation starts to make a lot of sense. However, many people still prefer to read tablature, or TAB because it is simpler. There is less detail in TAB and if you know the tune then it may be all you need to help you learn how to play a particular song. The downside of TAB is that it is harder to portray the timing of notes and so the two systems – notation and TAB – are often used together to help the guitarist interpret the music. On this site you’ll find some lessons on music theory aimed specifically at guitarists. There’s a good reason for that. Many music theory courses approach the subject using the piano to demonstrate the concepts. In many ways it is much easier to learn to read music if you have a piano in front of you. 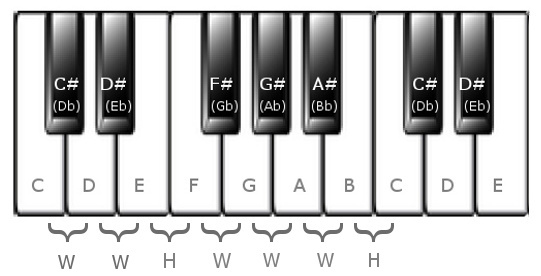 Each note can only be played on one key of the piano. If you see a written note on a staff there is only one key on the piano that corresponds to that note. However, that same note can be played in several places on a guitar depending on the string chosen. Piano music uses two staves – the top staff has a treble clef and bottom one has a bass clef. Generally speaking, the left hand plays the bass notes and the right hand plays the higher notes. A pianist will use similar actions for both hands It makes no difference if you are left or right handed – all pianos are arranged with the lowest note on the left side. A guitarist performs different actions with each hand. One hand frets the strings on the fingerboard and the other hand picks or strums the strings. All the information for both hands has to go on one staff. That means a lot of different symbols are used to provide the necessary instructions for a guitarist. Therefore, music theory courses which relate to piano keys are not that helpful to a guitarist. In the following lessons we’ll look at how music is written and what that means to a guitarist.